IT’S AN IMAGE that intuitively seems wrong. An England team, which included a young Stanley Matthews, stands reluctantly with their hands raised in the air. It’s gesture that to the modern fan seems entirely abhorrent, one that conjures up images of man’s brutality to one another. A photograph of the gesture circulates throughout the internet, and when it is not used to display England’s so-called shameful past in the press, it regularly appears in forums as an example of a confused and un-relatable past. What prompted these players to give the Nazi salute, and can we as modern fans ever truly understand the circumstances that led to it? To answer these questions we must travel first to 1935, the first time England’s government realised the political nature of the football. Germany, the country who two years previous had elected a Adolf Hitler as Chancellor, was sending their national squad to England to compete against the Three Lions. It was five years since the sides last met in Berlin and both the footballing and political structures of each country had radically changed in the interim. While there was a respect held for Hitler’s new policies amongst some quarters in England, others were sensing that something was amiss in Deutschland. This was demonstrated by the vociferous protests at the match. Targeting Tottenham’s White Hart Lane, which would hold the game, a series of protestors from trade unionists to Jewish organisations demanded the match be cancelled. The government’s decision not to involve themselves in the match was, contrary to their public statements, driven by political considerations. Officials such as Simon were well aware of the significance of the game for Germany’s press and more importantly, their government. There was a fear that Anglo-German relations would deteriorate should the game be cancelled, and hence under the pretense of the FA’s independence, the government washed their hands of the affair. Despite fears that anti-German demonstrations would present a challenge to the peace, the match itself was a relatively event-free affair. Over 10,000 German supporters arrived at White Hart Lane to see England put three past Die Mannschaft. Regardless of the scoreline, the Germans’ performance and discipline on the pitch commanded the respect of the English media and public. Given the relative amenity between the two sides on the field, each country’s respective FA agreed that a return fixture in Berlin would be scheduled. After several weeks of negotiations, it was decided that May 1938 would see England travel to Germany. Little did England’s FA realise how decisive this date would become in world history. In March 1938 Nazi Germany formally invaded and annexed Austria in direct violation of the Treaty of Versailles, signed in 1919. Faced with an act of German aggression, the response of the international community was mixed. For some, Hitler and Nazi Germany had disregarded law and order in favour of German expansion. For others, the Treaty of Versailles had placed unnecessary restrictions on the German state. For them, there were no problems in breaking an unjust law. Britain’s Prime Minister at the time, Neville Chamberlain, found himself caught between both viewpoints. In a speech to the House of Commons in March 1938, Chamberlain noted that while the British Ambassador in Berlin registered a protest against the German action, any attempt to prevent the move would have required the use of force, something Britain was desperately trying to avoid. The guns of the Great War still echoed in Chamberlain’s ears meaning that punishing Germany was out of the question – at least politically. Chamberlain was all too aware of the upcoming football game between England and Germany in Berlin, one that was about to take on a heightened importance for both the hosts and the visitors. England, on the other hand, was going into the game off the back of some worrying performances. Since defeating Germany in 1936, the Three Lions had lost a series of games to Wales, Scotland and Austria. While such defeats were interspersed with impressive victories over Hungary, Sweden and Czechoslovakia, there was a sense that the side were not as invincible as once thought. Indeed, according to the British Consul-General in Berlin, the Germans believed England’s reputation was far more generous than the reality. Furthermore, they believed that at the very least, the Germans were England’s equals, if not their superiors. Given the political climate at the time, it was perhaps unsurprising that both the German and English FAs found themselves faced with increased interest from their respective politicians. Anxious to prove Nazi superiority, no expense was spared for the German’s pre-match preparations. The German squad, composed of both German and Austrian footballers, were given two weeks to prepare in a secluded training camp in the Black Forest, where their only focus would be the upcoming friendly. The seriousness of the German side was matched by their fans, who frantically sought out tickets for the game. The Berliner Olympiastadion stadium had been purpose-built for the 1936 German Olympics yet even its 120,000 seating capacity failed to match demand. It’s estimated that in the weeks prior to the game over 400,000 separate applications were made for tickets. Though the England pre-match preparations remained relatively static, the FA informed the worried Vansittart that “every member of the team will do his utmost to uphold the prestige of his country”. How could they not? After all, the days leading up to the game had seen the English media produce article after article previewing the match. Journalists debated the relative merits of both teams as analogies for their political systems. Would the systematic German side defeat the more independently minded English? Would fascism prove more robust than democracy? Such questions permeated the minds of the English coaching stuff such as C. Wreford Brown, the FA member in charge of the match, and Stanley Rous. Both Brown and Rous stressed the necessity of victory to the English players, and while telling a team to win is a relatively innocuous instruction, Rous’s second demand of the England players proved to be significantly more problematic. Hours before kick-off Rous informed the England players that they would be expected to give the Nazi salute as a sign of goodwill to their hosts. Such an order, it must be said, was not given lightly. Rous had previously attended the 1936 Berlin Olympic Games during which Hitler had apparently been offended by the British team’s failure to acknowledge his presence. Given the powder keg that was European politics at that time, Rous’s request seemed the path of least resistance. It took the intervention of Nevile Henderson, Britain’s ambassador to Berlin, to placate the players. Informing Matthews and his team-mates that the Nazi salute was to be seen as a formal gesture towards their hosts but not an endorsement of the regime, Henderson managed to convince the England team to proceed with Rous’s wishes. Minutes later the English team lined out in the middle of the field alongside their German opponents. In full view of German diplomats such as Goebbels, Goering and Hess, the Three Lions raised their right hands in the air as per Rous’s instructions. Hitler, whom Rous had been so concerned about not offending, was absent from the game, having only returned from Italy days earlier. Scholars now suspect that Hitler missed the game as he was in the midst of planning to invade Czechoslovakia towards the end of May. Once the English players’ arms angrily fell to their sides, the game finally commenced. Given all the pre-match discussion about the German side’s talent, one would be forgiven for expecting the English team to capitulate. The reality was anything but. Though the Germans had the upper hand in the game’s opening stages, it wasn’t long before the English superiority shone through. Sixteen minutes into the first half, Cliff Bastin cut inside from the left wing to rifle a volley past Hans Jakob, the German goalkeeper. A wry smile no doubt cut across the faces of the England officials. They may have been forced into giving the Nazi salute, but revenge would surely be theirs on the field. Within four minutes, however, Rudi Gellesch had levelled proceedings for the hosts. Despite the roars of the home crowd, any hopes of a German resurgence were quickly put to bed when Sheffield Wednesday’s John Robinson headed in from a corner. Just two minutes later Frank Broome got on the end of a cutting cross from Donald Walsh to score England’s third. For Broome, it was a debut that would live long in the memory. Just minutes before half-time, German woes were amplified when Stanley Matthews beat three German defenders with ease before rifling a forth past the now forlorn Jakob. Though Germany managed to reduce the deficit to two goals before the interval, the match was effectively over. The second half would see a brief German resurgence but England once more proved the better side. In spite of all the German rhetoric of master races and superior players, England’s 6-3 victory proved otherwise. As the fans and players dissipated from the stadium, English and German commentators began to make sense of the game. Similarly, the English Foreign Office informed the FA that the government felt that its pre-match request had been fulfilled to the letter. Such sentiment was shared by the FA, who noted its “special appreciation” of England’s efforts; a special appreciation later manifested in a canteen of cutlery given to each English player post-tour. While Henderson looked towards the “promise of cordial relations in the future insofar as sporting fixtures are concerned” between England and Germany, journalists in both countries took an altogether different attitude towards the game. For The Telegraph, England’s victory over Germany proved England were still the “masters of football”. The Scotsman argued that the resounding victory had proven England’s prestige once more in all matters of sport. More boisterously, the Aberdeen Press led with the headline ‘Germany well whacked’. Remarkably, despite the well-worn press coverage of modern writers, little comment was made about the Nazi salute from English journalists. Prior to the game, some newspapers had commented that the players may give the salute as a sign of respect, but none openly took umbrage with the gesture. 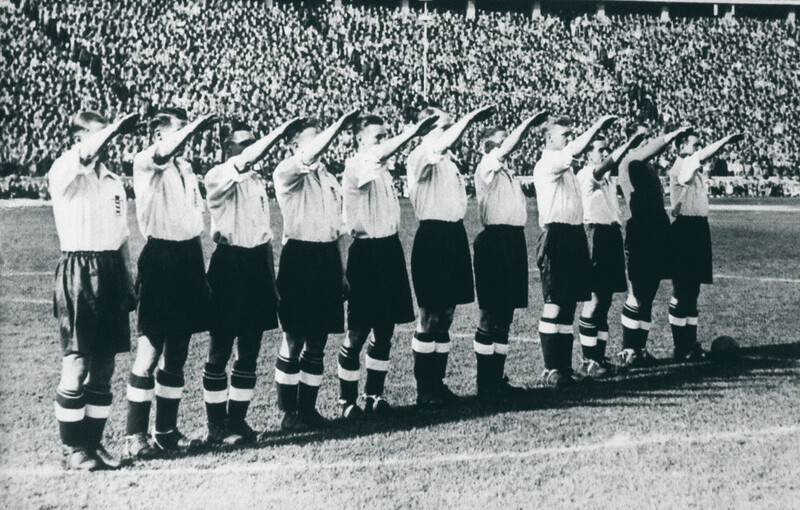 Even post-victory, many newspapers ran with the line that “the Englishmen gave the Nazi salute, as it had been previously decided that they should.” Though there is evidence that many were incensed by the decision to force the players into giving the salute, this anger did not extend to the majority of newspapers. The Times went so far as to congratulate the English gesture, noting that it was a tremendous mark of respect to their hosts. In Germany, pro-Nazi newspapers seized upon the English player’s salute not out of malice but more so out of admiration. 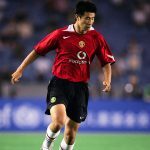 The English players were the superstars of the age, idols to the German fans and players. That they had shown such respect to their hosts was greatly appreciated. The day after the game, the Berlin newspaper Bachter proudly issued the photograph on its front page as proof of English respect for the regime. Despite modern rhetoric that the Nazi salute was an embarrassment to the English nation, contemporary views were much more complicated. For English newspapers, politicians and football officials, the salute was a gesture and nothing more. It was a far cry from what the BBC labelled in 2003, “one of the darkest moments in the sport”. For English players the salute was arguably a much bigger problem but unfortunately it is difficult to know how far their anger extended. Those players present for the decision only wrote their memoirs decades after the fact at a time when anti-German sentiment was at its highest. As Simon Kuper argued many years ago, for contemporaries it’s likely that the salute was much ado about nothing. So why do we as modern fans struggle with the image? Why do newspapers constantly use it as a source of English shame in sport? The answer, perhaps unsurprisingly, lies in the historical perspective. For us, the Nazi salute is a sign of support for a regime that by September 1939 would drag Europe into one of the bloodiest wars in modern history. For us, the gesture is an affirmation of a regime that committed unspeakable acts of violence. This knowledge was not available to Henderson, Rous or the England players. For them, the salute was a gesture towards their hosts. A piece of footballing admin. For them it was an unimportant side element to the game at hand. For them, the real business was football. Though football is often politicised, the incident should be a stark reminder that football can only be politicised if we allow it to be. Through continuous re-telling of the event, we have forgotten the most important element of the game: England won 6-3. As a neutral to English football, that seems an altogether more important story.